A 2010 study by two universities in Missouri determined that the density of honeysuckle in forests correlated with the increased population of ticks in those same plots. Get rid of bush honeysuckle in your forest and you reduce the potential risk from tick-borne diseases. The book also includes information on grafting and growing from cuttings. This 1992 book is based on Agricultural Handbook 450, published first by the USDA Forest Service in 1948, which covered fewer than half as many genera. There are other publications on this subject as well, but I am most familiar with this book. "Note that the Division of Forestry, based off Indiana Code 14-23-1-1 that was added in 1995, is recommending fees for services to landowners. Anyone think that the Illinois DNR is not paying attention to this? Illinois agricultural producers who want to improve natural resources and address concerns are encouraged to sign up for the Environmental Quality Incentives Program (EQIP) through the USDA-Natural Resources Conservation Service (NRCS). Eric Gerth, Acting Illinois NRCS State Conservationist, announced that November 20, 2015 and January 15, 2016 will be the two EQIP application deadlines in Illinois. “Producers can sign-up for EQIP at any time throughout the year, but to compete for the upcoming funding periods; I encourage producers with resource concerns to submit an application by one of the application deadlines.” Gerth explains. Many applicants have interest in funding pools that address soil erosion and water quality issues on cropland. However, there are also funding pools for grazing land operations, confined livestock operations, organic producers, and wildlife habitat improvement, just to name a few. In addition to conservation practices, EQIP provides funding for the development of plans, such as Comprehensive Nutrient Management Plans (CNMP), Grazing Plans, Drainage Water Management Plans, and more. Producers interested in EQIP should submit a signed application (NRCS-CPA-1200 form) to the local NRCS field office. Applications submitted by November 20, 2015 and January 15, 2016 will be evaluated by NRCS staff for the funding period submitted. The staff will work with producers to determine eligibility for the program and complete worksheets and rankings in order for the applicant to compete for funding. EQIP is a voluntary conservation program available for agricultural producers. Through EQIP, NRCS will provide financial and technical assistance to install conservation practices that reduce soil erosion and sedimentation, improve water and air quality, and create wildlife habitat. For information on EQIP, contact the local NRCS field office or visit THIS SITE. This isn't a comprehensive list and shouldn't be used as a substitute for professional training. I'll expand this list based on any suggestions. If you attended Duane Mitch's Workshop tour in August, you mat be interested in some of the products that he uses. One of the places that carries Dirtex, Hide Glue, and Ultra Fine Steel Wool is Amazon. Be aware that the spray Dirtex that they carry cannot be used on varnished surfaces - it is so strong a cleaner that it removes the varnish. The powdered Dirtex is safe for varnish. Some loggers in Michigan are falsely telling walnut land owners that TCD has been detected in the state (and apparently in Indiana too) as a way to get landowners to sell their trees. IDNR Regional Forester Randy Timmons says, "TCD has not been confirmed in Illinois so if anyone if claiming it is, they may be involved in some sort of scam or intimidation." Stihl USA has posted a pretty good summary of tips on firewood, from selecting the right wood, to splitting, stacking, and storing it. To go to their guide, CLICK HERE. 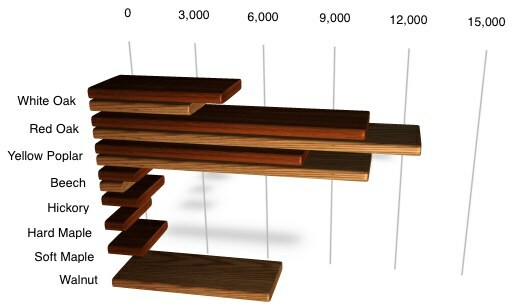 I recently came upon some numbers showing hardwood exports by species and country. They surprised me. For one, I hadn't expected Vietnam and Canada to be the primary consumers of our lumber and logs. Evidently, much furniture manufacturing has moved from China to Vietnam due to lower labor costs. Secondly, I didn't realize that red oak was in demand by the export market. If I can find some numbers that show domestic consumption to put these in context, I'll post them later. 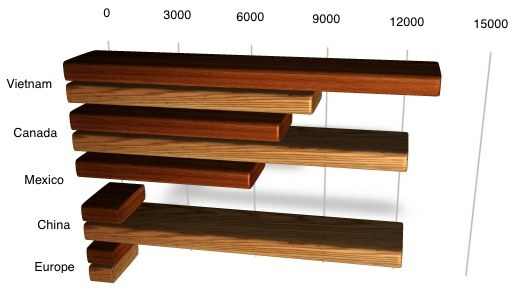 The darker board represents lumber volume; the lighter board represents log count. I'm not sure the numbers can be compared, but wanted to show relative size of the exports. Penn State University does a great job of producing webinars on woodland management. This one should help in assessing the value of your timber. This recorded webinar can be accessed HERE.